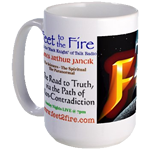 Enter coupon code "FEET2FIRE" and receive two more DVDs and an MP3 DVD with HOURS of commentaries and supplemental material free! The Amazing Qualities of Hydrogen Peroxide have been know for over a century! Read this Free PDF and Click above pic to buy from James's trusted source. Tell them Feet to the Fire sent you! Download a CD-Quality MP3 of Samson Orion's Interview on F2F with a purchase of his book. 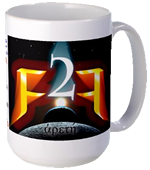 Lowest price in the world, courtesy of Susan Orion, Samson's widow for F2F listeners! These Shows are Free to Listen and Download... they are not free to produce. Anyone who wishes to help keep this show running and investigating issues without constraint, can do so by via Pay Pal, Bitcoin Or by US Mail: James A. Jancik PO Box 511 Minooka, IL. 60404 USA. Joan Osbourne - "One of Us"
Blessed Union of Souls - "I Believe"
Peter Gabriel - "In Your Eyes"
Norman Greenbaum - "Spirit in the Sky (demo)"
JANCIK - "Oh, Ancient One (F2F Ending Theme)"
Les Visible is a writer and recording artist. He has had a lifelong love affair with the Hermetic Sciences and the Martial Arts. He is a seasoned traveler in psychedelic realms and prefers the Devic Kingdom over the suffocating confinements of the Sub-Matrix. Along the way he has matriculated from the military to prisons and the maximum security wards for the criminally insane. Each month. Les will share a passionate slice of his kaleidoscope of consciousness. He lives in various places in Europe with his wife Susanne and his memories. James will take a name from email each week, and work with listeners to send energy to the person for their self-healing. Please think of this person this week, and visualize sending healing, love, energy. Lional Parkinson - Author: "The Holy Virus"
Lional returns to Feet to the Fire to discuss in more details the archeological find that proves who "The LORD" of the Bible really was. Lional's book, "The Holy Virus" outlines how the Old Testament was "infected" when about 90% of the Israelites were slaughtered and the remaining few were taken into slavery by Babylon. The leaders, priests, teachers, businessmen, etc. were killed leaving the weak, many unlearned, people left to be indoctrinated by the Babylonian priests who wrote in and over the original Israelite Scriptures, teaching a blood sacrifice was to be made of the innocent to atone for the guilty. Jesus knew of the real teachings of the One True God, calling him the Father and speaking of repentance, honestly, helping the poor, the needy and forgiveness and mercy over judgment and punishment. This, of course, resonated with the people who truly seeking God and Love and threatened the Blood Lust of the Babylonian tainted Priests and leaders of Israel. We will talk about an ancient find from the reign of Cyrus who freed the people to return to there lands and rebuild their temples. The Bible omits the actual name of this God of of Heaven" But the Cyrinian scrolls do not! "Feet to the Fire" © ® - MMIII-MMIV James A. Jancik. All Rights Reserved.